Here’s a fun task for you: go to the Google Play store and try and find a decent game to download. Sounds easy, doesn’t it? Well it isn’t. Finding decent games on Google Play is like trying to find a diamond in a Mount Everest-sized pile of horse dung – difficult and uncomfortable (but not as smelly). There are just too many games to choose from, and most of them aren’t that great. Fortunately, we’ve taken some time to dig through the Google Play mire and have dug out some bona-fide gaming gems for you all to sink your teeth (and possibly your money) into. To save you scrolling, just click on any of titles below to learn more about it! Do you like smashing stuff, but hate the consequences that come with doing it (i.e. angry parents, unplanned bills and jail?). Then you’ll love Smash Hit! The premise of Smash Hit is simple; destroy as much stuff as possible by throwing balls at it. It’s like Angry Birds, if Angry Birds was set in a branch of H. Samuel. Boasting realistic physics, a lovely soundtrack and some seriously arty visuals, Smash It is actually quite a beautiful game. But don’t let that distract you from the fact that this is purely a game about smashing stuff – go forth and destroy! Swordigo is a throwback to retro side-scrolling hack n’ slash and platform games, drawing on the likes of Ghouls N’ Ghosts and Mega Man, with a bit of Zelda thrown in for good measure. How much you’ll like this game depends on how excited that last sentence got you – if you loved any of those games, you’ll probably love this. That said, people not familiar with the classics of the genre might enjoy it too as it’s easy enough to pick up and the graphics are pretty good for a mobile game. Be warned though; this game is tougher than Phil Mitchell eating a well-done steak. If you want a quick and easy way to pass a couple of minutes, this isn’t for you. Bad Roads 2 is one of those inexplicably popular games where you basically do someone else’s job. Playing as Ted the trucker, Bad Roads 2 tasks you with driving some unsecured goods over some of the worst potholes ever seen (no, the game isn’t set in Britain). This is simple fun and great for a quick blast on the morning commute. Just don’t expect anything too complex. Kingdom Rush is a tower-defence game in which you have to protect your kingdom from nasty little invaders by building increasingly powerful towers and barracks. Think Plants v. Zombies meets Monty Python and the Holy Grail and you’re not too far off Kingdom Rush. While the concept might not appeal to everyone, the gameplay certainly will – it’s ridiculously addictive. Give it a try; it’ll be the best 60p you ever spend. Combine Temple Run and Left 4 Dead and you get Into the Dead, an endless runner in which you have to avoid hordes of zombies. At first, you start off with nothing but your bare fists and your feet to escape from the zombies but raising cash through repeat plays (or buying coins – you could sell some games if you get really addicted…) allows you to unlock shotguns, chainsaws, pistols and a zombie-hungry dog to help you progress further. Into the Dead is a pretty repetitive game, but the determination to top your old high score will keep you going for hours. New Star Soccer is without doubt the best football game on Android, combining retro graphics with a simple-yet-brilliant swipe-and-tap control system. NSS is slightly different to other football games because you only play as a single player, but don’t let that put you off; the career mode (in which you guide your player from non-league to the big leagues) is incredibly addictive. NSS recently made a controversial move to a Free-to-Play model (it previously cost £1.99, but you got all the features from the off) but that doesn’t overshadow the fact that this is a brilliant game. Badland is one of the best looking games on Android, drawing inspiration from the indie hit Limbo. In fact, the whole game is similar to Limbo, with players ensuring the survival of some cute little furballs as they trek through a land of big, nasty machines. 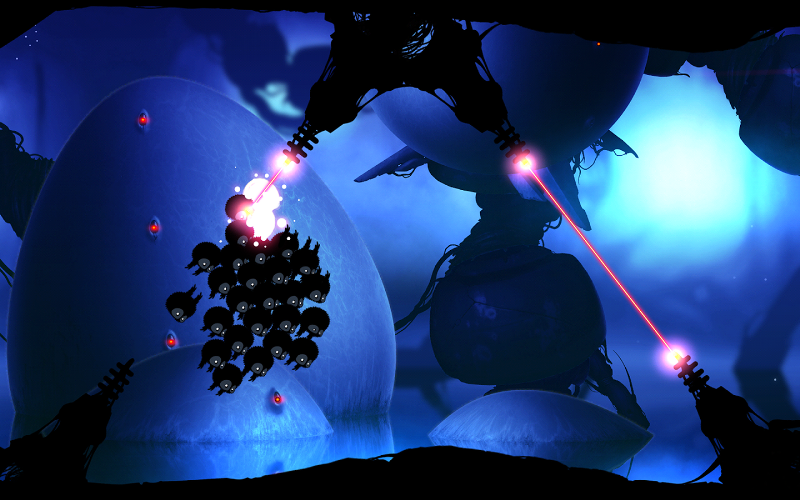 Badland’s gameplay is simple but addictive; you tap and hold once and your band of furballs jump up. Let go and they start to fall down. This control system is the basis for a series of trials in which you have to navigate spikes and machines, making the game something of a trial-and-error experience in which you have to determine how long to hold your taps for. It’s difficult and frustrating, but it’s rewarding and a definite must-have for serious gamers. You’re the boss of the Death Star and have to add new weapons, recruit new staff (the Empire gets through Stormtroopers like no-one’s business) and keep the Emperor pleased – need we say anymore? This is essential for Star Wars fans. A simple-yet-beautiful puzzle game in which you have to connect as many same-coloured dots as you can within 60 seconds. It sounds simple, but it’s massively addictive and surprisingly challenging too! Vector combines the endless running of Temple Run with the parkour craze that took over Britain for about 2 weeks in 2005. Cast as a man escaping from a ‘Big Brother’ society, you have to run from a gang of taser-wielding baddies by jumping, rolling and flipping – all carried out with a single swipe. Earning cash allows you to buy new flips, which make your escapes look even better. Radiant HD is a space-shooter which is more or less a combination of Space Invaders and R-Type. Like both of those games, Radiant is tough as nails and supremely addictive too. With some awesome retro graphics thrown in, this is a brilliant blast to the past. FPS games don’t tend to work well on mobile devices, but Dead Trigger is an exception. If you’ve ever played Call of Duty’s Zombies mode, you’ll be more than familiar with the concept of Dead Trigger; you’re plonked onto a map and have to survive an ever-present horde of zombies (either by killing them or running away). Occasionally, you’ll get set an objective or a mission (usually ‘collect this item and return it back to the start’) but the real fun lies in shooting zombies in the face with an uzi. Bliss. Have you found any Android gems you’d add to this list? Let us know below or on Facebook or Twitter and we’ll add it to our list (with credit to you, of course)!